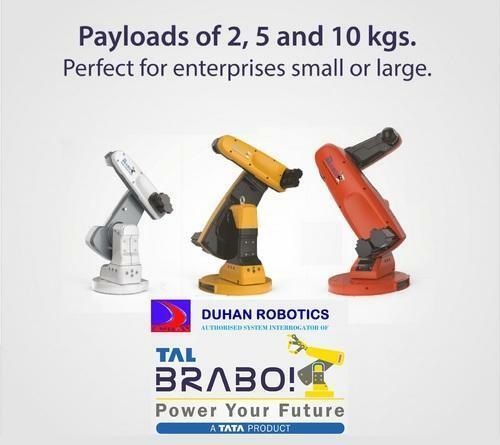 DUHAN Robotics is authorized channel partner & system integrator of TAL BRABO Robot. The offered range of robotic solution with BRABO Robot includes Robotic Inspection, Robotic Testing, Robotic Material Handling, Robotic Packing, Robotic Assembly Line, Robotic Palletizers, Robotic Welding, Robotic Pick and Sort installation etc. We offer best Robotic Machine Tending solution for your factory automation. Today we feel advanced level of study is required with advanced level of study facilities. We offer Educational Robotic Lab for educational institutes. We are a trusted enterprise engaged in providing Robotic Pick and Sort System. Offered robotic system is rendered in adherence with the set of industry standards keeping in mind exact need of clients. The offered system is highly acknowledged due to its timely execution, reliability and flexibility. This system is offered at highly competitive price to our prestigious clients. Providing Robot of any reputed brands (ABB, Fanuc, Yashikawa etc.) as per customer requirement. Selection of best robot as per application. Also provide Vision camera and other if required. Design and development End Effector and other required system for the application. Robot fencing is provided for safety. Technical Support after installation of project. Owing to our expertise, we have been able to offer our clients Robotic Welding Cell which are used in automobile industry to increase productivity & reduce manpower. This system is rendered by our professionals keeping in mind precise requirements of clients. In order to render this system, our professionals use advanced techniques and methodologies in compliance with the set of industrial standards. Our valuable clients can avail these system from us at market leading rates. Complete Robotic Welding Solution will be provided for MIG Welding and Spot Welding. Design and development Welding Fixture and other required system for the application. We are involved in offering Robotic Palletizers System to our valuable clients, spread all over the nation. These systems are available in fully automatic options, which provide safety, speed and great reliability. The system offered by us are executed with the support of technicians and other associates in synchronization with the universal norms. Apart from this, our offered systems are upgraded from time to time as per the latest trends of the market. Our affordable robotic palletizers handle a wide variety of products safely, successfully and efficiently. Selection of best and effective design for palletizing. We are one of the leading system providers of Robotic Packaging solution to our clients. Offered solution are rendered by our team of experienced professionals by utilizing cutting-edge technology as per the latest international standards. We offer these systems in various industry and other related sectors. These systems are appreciated for timely execution and hassle-free work performance. Further, thesesystemsare rendered as per the specific needs of clients at industry leading price. Selection of best robot as per packaging application. Design and development End Effector, Conveyors and other required system for the application.